This confectioners looks like it has been here forever: probably producing and selling the same wonderful stuff for ages and ages, attracting new generations of young children again and again with the same sweets and waffles. But don’t be fooled by the lovely façade and décor. Meert is actually brand new. At least here in Paris. 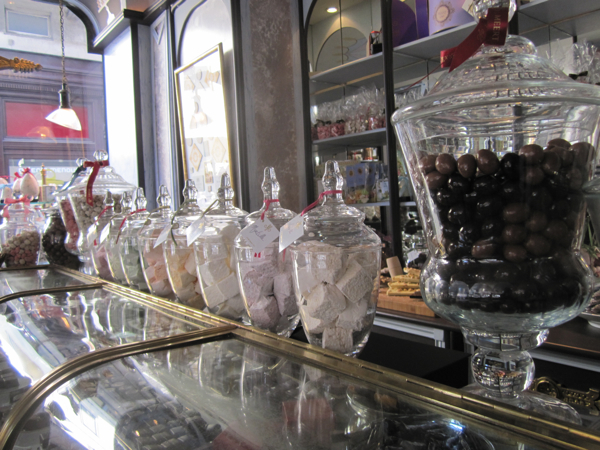 This sweet and chocolate shop on rue Elzévir, close to the Musée Picasso, opened just a few months ago. But it truly looks as if Louis XVI himself would have sent his servants here to supply him with the best stuff. To tell you the truth: Meert is actually from Lille, North of France, where it is an institution and even a major tourist attraction. The shop there opened back in 1761. In other words: at a time, when not Louis XVI, but his father ruled the country... Meert quickly became famous for their ice creams and waffles. 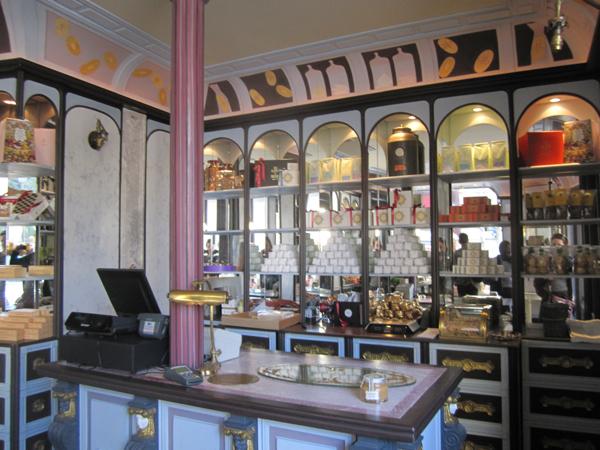 If you happen to go to Lille one day, you must visit this beautiful salon de thé, designed in the middle of the 19th century in an oriental and truly flamboyant way. If you dont happen to go there, don’t worry. Just make a stop on your Marais walk on rue Elzévir and try the famous waffles right here in Paris. Even if the small boutique is just a pale imitation of the venue in Lille, it’s still a lovely and delightful place that will easily shake your resolve to somehow limit your intake of calories before summer. Old moulds, labels, original drawings and old metal boxes are gathered here as beautiful body of evidence of the early heritage giving the place its nice old world charm. Cookies, chocolates, gimauves and pâtes de fruits are displayed in numerous glass jars looking as beautiful as jewels. The speciality of the house is still the waffles – a somehow very bourgeois variant of the vulgar gauffres you might get now. They are oblong, flat and filled with a sumptuous, vanilla cream which is deliciously sweet, and when I say sweet, I really, really mean it. It’s known that Charles de Gaulle, who was born in Lille, loved the Meert waffles and would buy small stocks of boxes to present as gifts for visiting dignitaries. We don’t know if Martine Aubry, mayor of Lille, is an addict, too. It might be a good reason to make her France's first female president.